For the past few years Hallmark has had an online store via Zazzle where you can not only order printed items, but you may also customize the prints for yourself or the Rainbow Brite fan you know! I decided to order two items to review them. I wanted a poster for my office space, but nothing as large as my theatrical poster. 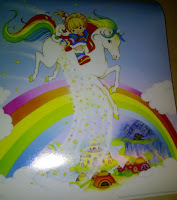 Many of the real Rainbow Brite posters that were given away in magazines were not as large as that either. I chose a nice classic print in 11 X 13.20 inch poster ($11.75). I selected the value matte finish. When I received my poster I was very impressed by the print. I'm sure the print quality varies depending on size of the poster you order, but for the size I requested I like it. The paper may be "Value" but it's actually much thicker feeling then a vintage poster. I also ordered a custom item. A custom button with the classic Rainbow Brite logo ($3.60). 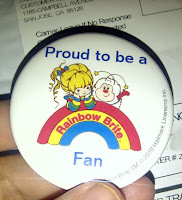 I made it simple, with a "Proud to be a Rainbow Brite Fan" as the over all message. It would be a nice addition for just about anything you wear. You can customize anything you like with whatever you want it to say. A name, a date, etc. Not a bad price for something to customize. And then there is the size: 2 1/4 inch round. They used to charge that much for the old ones at HotTopic, and those were the size of a nickel. I think it's a great value. Zazzle has a bunch of prints you can customize and make your own! Even if you share your order, you can get a discount on the next. I recommend keeping an eye out for shipping deals, also. 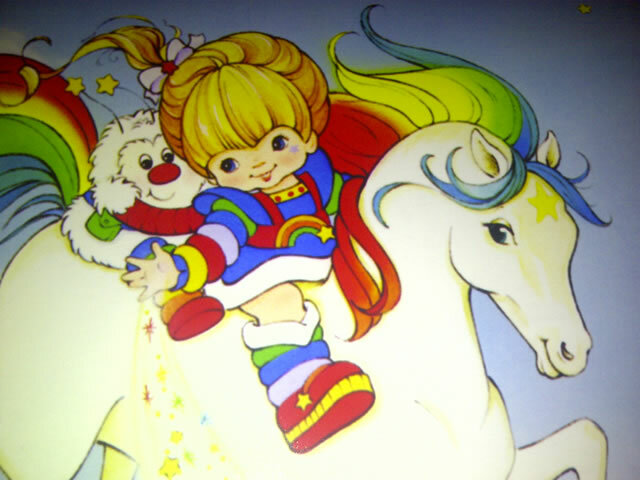 If you have ordered a Rainbow Brite custom print from Zazzle, let us know!